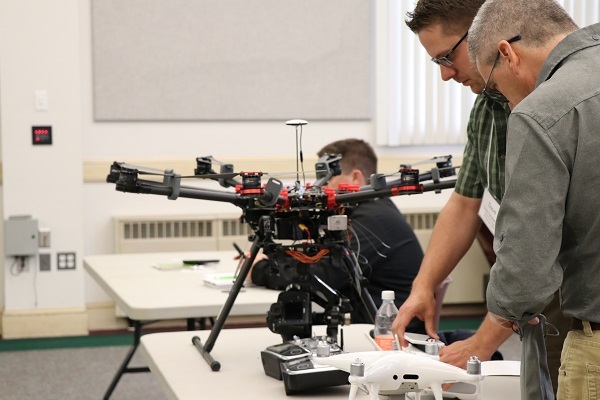 Speakers at the conference covered a wide range of topics such as using LiDAR applications for forest management, aerial agronomy and drone data usage for potato growers. Jesse Badger, of the New Hampshire-based company Precision Unmanned Aerial, discussed how his team has evolved in its use of aerial agronomy, the process of using unmanned aircraft to collect data that can be utilized in precision agriculture management systems. Badger highlighted three major points concerning his company’s exploration of aerial agronomy: where they were the beginning, where they are today and how they imagine the future of aerial agronomy. In 2014, Precision Unmanned Aerial purchased a UAV sensory drone, which was able to take images of 60 to 80 acres per flight. After realizing that they did not know what the images displayed, Badger and his team conducted another flight the next day over the same field they had used previously. Within two years, Precision Unmanned Aerial found ways to optimize drone mapping so that they could show farmers the best areas to use for irrigation and find ways to process their own data more quickly and with smaller files that are more user friendly. In 2017, Badger purchased gear that can fly over and process images of 160 acres per hour and make images available instantly on PDF and KMZ files. He showed a sample of a PDF file from a day in which the drone flew over 28 acres in only 11 minutes. In 2018, Precision Unmanned Aerial will use custom sensor drone to detect late blight in potatoes. Badger said that he would eventually like to see farmers have an aerial agronomist on staff and be able to use spray drones that target individual blight sightings instead of entire fields. “The sensors we have now for drones in aerial agronomy are faster, better and more efficient,” Badger said. Nikhil Vadhavkar of Massachusetts-based Raptor Maps, Inc. spoke about what potato growers in Aroostook County can achieve by using drone data. He said that drones allow farmers to have less data, which makes the data they obtain easier to manipulate. In Aroostook County, Vadhavkar has used Ground Truth Data to map the size distribution of fields and Machine Learning to detect potential PVY outbreaks in crops. Closing out the all-day conference was Joseph Young, executive director of the Maine Geographic Information GIS User Group, who spoke about the nonprofit’s Maine GeoLibrary Program. From 2012 to 2016, the Maine GeoLibrary coordinated the mapping of 76 communities in Maine using orthoimagery and LiDAR technology. Young said that GIS mapping contains more accuracy than techniques used by Google Maps and similar companies and provides a less than $1,000 cost for each community that takes part in the Maine GeoLibrary’s mapping project. In 2017, the Maine GIS Group will start the next phase of its state mapping in Cumberland and York County, with the plan taking them to Aroostook and Piscataquis Counties in 2022. “As we go forward mapping with better imagery is going to improve mapping imagery of the whole state,” Young said. Chunzeng Wang, professor in geology, GIS and environmental science at UMPI, said that the MEGUG conference was a great success. UMPI’s GIS Laboratory began using small unmanned aircraft vehicles (UAVs) in GIS-related projects in 2016. When MEGUG and Maine GeoLibrary decided to host a special conference in March 2017, Dr. Wang, who works with MEGUG, played a leading role in organizing the event, which was the first conference of its kind held in the state of Maine. “Agriculture and forestry are two most important economic forces in Maine. 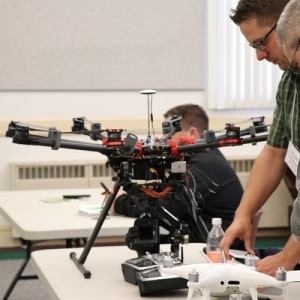 UAVs are emerging and revolutionary technology that will change the way farmers work and the way foresters manage forests,” Dr. Wang said. For more information about MEGUG, please contact Dr. Wang at chunzeng.wang@maine.edu or Joseph Young at joseph.young@maine.gov.